This review is about item#58375834. I did not have any inventory items and compared with other shops, It was a big help because the delivery date was the fastest. This review is about item#58375843. Used to replace water fittings. I do not particularly care about consumables, but I was able to replace the water utensils safely. The quality is not inferior to the manufacturer. I am happy that it is cheap. The price is inexpensive and can be ordinary as well as those of other companies. There is no problem at all. From the brand new to the seal tape the case body is too big to use It is unusual to use with the feeling of feeling of the end of the tape from the beginning. There are differences depending on the product, but you can use it around the water Airtru ordinarily. Although there is no problem in sealing performance, it seems to be slightly hard compared with other manufacturer's products, it is hard to cut by hand. I am satisfied that it can be used without problems. It is good that the protective cover is attached. Stickiness when pulling the tape is somewhat weak, but it can be used without any inferiority to other products and it is cheap even if it says anything, it is saved. It can be used without any problem. Very cheap and saved. The leak from the joint connection part was safely stopped. It is cheap, quality is no problem, it is a good product. The outer transparent case is also user friendly. For sealing of pipe etc. Easy to use, especially problematic, inexpensive so useful. Since it is rolling up a lot, I can use it because I can use it a lot. Quality is no problem. I think that it is not inferior to Nitto Denko's seal tape, it has run out without any resistance. 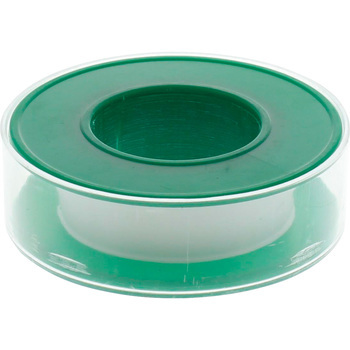 It is an ordinary seal tape. I believe that there is sufficient sealing effect. Early arrival of goods, the price is also very satisfied. I would like to order regularly in the future. It can be used normally. Quality etc. There was no problem at all.